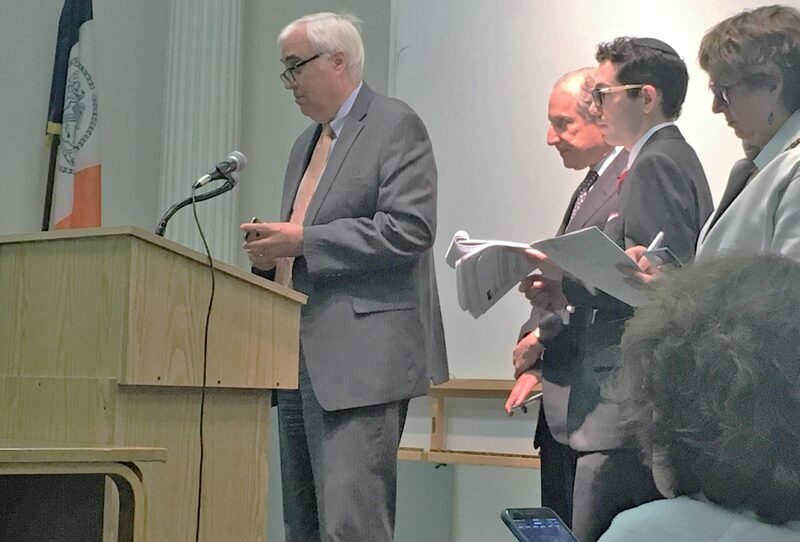 From left to right: Frank Chaney (the plaintiff’s lawyer), Paul Selver of Kramer Levin (the defendant’s lawyer), Michael Zoltan (Assistant General Counsel at the DOB), a representative of 170 West End Avenue. The community rallied once again today, continuing ongoing efforts to curtail the unchecked rise of a supertall tower at 200 Amsterdam. LANDMARK WEST! 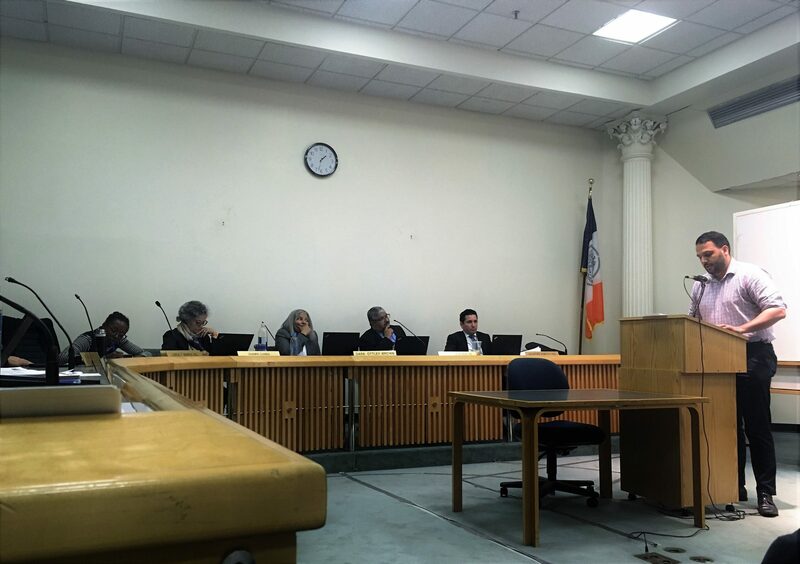 was downtown at the Board of Standards and Appeals, adding our testimony to that of neighbors, fellow preservation groups, and elected officials speaking out in support of those demonstrating that the building permit issued to the developers of 200 Amsterdam Avenue was not valid since their purported “zoning lot” does not meet the definition of a true zoning lot according to the Zoning Resolution. While we were there, we encountered one particularly surprising development: the Department of Buildings actually spoke out in agreement with community opposition. A little context: one of today’s primary issues centered on whether the terms “tax lot” and “lot of record” refer to the same thing. Clarifying this is crucial, as the developer’s case hinges on how they have cherry-picked individual tax lots, gerrymandering bits and pieces of allowances to permit them to build a tower significantly taller than zoning allows. By utilizing as-of-right building rights cobbled together from partial parts of different tax lots, they managed to dodge the zoning protections designed to prevent such egregious out-of-scale development. In response, the plaintiff–The Committee for Environmentally Sound Development, represented by Frank Chaney of Rosenberg and Estis, PC–focused on showing that “lot of record” and “tax lot” are actually synonymous, and that language governing “lots of record” might inhibit this kind of zoning. If a “lot of record” is equivalent to a “tax lot” then clearly the developer had manipulated its supposed tax lots. The surprise, as mentioned, was that the Department of Buildings (DOB) spoke out in agreement with this, explicitly stating that “lots of record” and “tax lots” are equivalent. This strengthened the plaintiff’s argument, but the developer’s lawyer–and several of the BSA commissioners–insisted that the wording could be interpreted differently, that tax lot and lot of record were not necessarily equal. The developer’s lawyer maintained that their position was the historic position of the DOB, even if this kind of manipulation has only appeared, in the most generous estimate, in 1% of cases in DOB history since this wording first appeared–and despite the DOB’s clear and current disagreement with the developer’s lawyer’s interpretation of the text. After both parties had spoken in-depth before the BSA and answered questions– disagreeing thoroughly– public testimony began. Sean Khorsandi (Executive Director of LANDMARK WEST!) gives our testimony to the BSA. First up were the elected officials, with Councilmember Helen Rosenthal speaking in support of the community and of the Committee for Environmentally Sound Development’s appeal, and bringing with her the support of the majority of the City Council, with 27 council members, representing all five boroughs, also pushing back against the gerrymandering seen at 200 Amsterdam. Further speakers included, of course LANDMARK WEST, along with a slew of neighbors, our fellow preservation organizations the Greenwich Village Society for Historic Preservation (read their statement here), the Alliance for a Human Scale City, the Municipal Art Society, and numerous small neighborhood groups. The overwhelming majority of the statements were echoing the very same points we have all been stressing for months: this is an out-of-scale, gerrymandered hulk of a supertall, and by allowing it to slide through unchecked, embracing a sneaky strategy to wriggle through an outrageous loophole, the BSA runs the risk of establishing a dangerous precedent that could have devastating ramifications for the whole city.